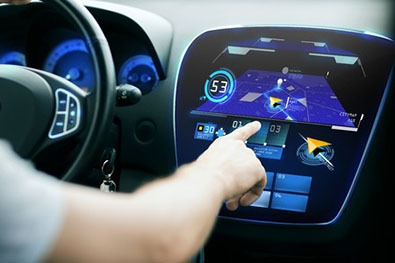 New cars are being sold with infotainment systems which are transforming the way we drive. By simply tapping the small screen, drivers can now access a whole world of conveniences, including GPS, voice activation software, the Internet and even social media. While these features may seem like a lot of fun, they are a distraction for drivers and improper use can cause crashes. If you have been injured and suspect the driver was distracted by an infotainment system or cell phone, inform the police department which is investigating. Then contact a Boston car accident lawyer to learn your rights. In 2017, AAA released a study on infotainment systems, reporting on 30 vehicles from the 2017 model year. Of these, 12 vehicles had infotainment systems which were "very high" distractions. These vehicles allowed drivers to program directions while operating the car. This task can take a driver's eyes off the road for up to 40 seconds. On the list of vehicles with the most distracting infotainment systems: the Audi Q7 QPP, the Honda Civic Touring and the Ford Mustang GT and others. Many states ban cell phone use by drivers and others like Massachusetts ban texting while driving. Junior operators in Massachusetts are banned from all cell phone use behind the wheel. But there are no state bans on infotainment systems in cars, even though they can be just as distracting as cell phones. Instead, the federal government is working to get consumers to use infotainment systems and cell phone devices in a safe, streamlined way. In 2016, the National Highway Traffic Safety Administration (NHTSA) recommended manufacturers use technology to pair mobile devices with infotainment systems, reducing distractions. The NHTSA also recommended use of driver mode, a simplified user interface for vehicles. Distracted driving causes many car accidents. In 2015, 3,477 people died in crashes caused by distracted driving, according to the National Highway Traffic Safety Administration. Another 391,000 were injured. The agency defines distracted driving as any activity that takes a driver's attention away from the road. This can include talking to your children or tuning the radio dial. But cell phone use is a common cause, whether that is talking on a phone, texting or pulling up directions from Google maps or another app. After a car accident, your first priority is to visit an emergency room and be treated for your injuries. Then, if you are injured, find the best attorney you can to protect your interests. Distracted driving is negligent. An experienced Boston car accident attorney will evaluate your case and determine if you are entitled to file a claim. You may be entitled to monetary damages for pain and suffering, payment or reimbursement of reasonable medical expenses and lost wages. You may also be able to recover to compensation if you have a loved one who has been killed in a car accident caused by negligence. It is important to contact a lawyer promptly. In Massachusetts, there is a Statute of Limitations restricting how long you can file your claim for compensation. The attorneys at Breakstone, White & Gluck have over 100 years combined experience in handling personal injury and car accident cases. Our office is conveniently located in Government Center in Boston and we have handled cases in Boston, Cambridge, Brookline and Somerville as well as throughout Massachusetts. We have the experience, expertise and resources you need to successfully resolve your case. Our attorneys are experienced at working with police, accident reconstruction teams and insurance companies. We have successfully handled complex cases from the insurance claims level through trial and appeal. For a free legal consultation, contact us today at 800-379-1244 or 617-723-7676 or use our contact form. Learn more about us by reading our Case Results page. We have also included a few cases below.